When we revealed the first details of the mysterious new figure taking on the iconic mantle of the Wasp earlier this year, there was still so much we didn’t know about her. Now the character has now made her official debut in All-New, All-Different Avengers #9, and her surprising identity has been revealed. Although we had a recent tease of the new Wasp in action on Free Comic Book Day, today’s All-New, All-Different Avengers #9, by Mark Waid, Mahmud Asrar, Dave McCaig and Cory Petit, finally gives us some solid answers as to who this new Wasp really is. But before that, not everyone is exactly happy that Janet Van Dyne’s heroic legacy has been randomly pilfered by another woman—especially the Avengers’ stalwart companion Edwin Jarvis, already beginning to crack under the frustration of butlering his away around an abandoned hanger instead of a swanky mansion like the good old days. Jarvis, finally snapping, lays into the new Wasp, decrying her for tarnishing Janet, until she drops the bombshell: Janet might not mind so much, as this Wasp is her stepdaughter. 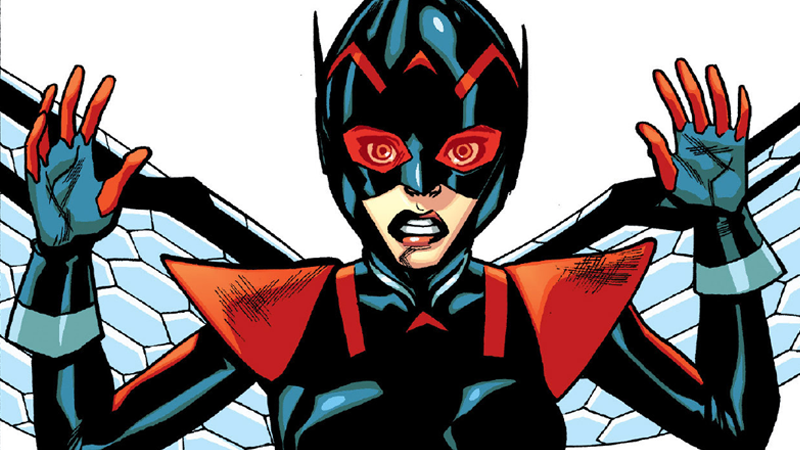 This is Nadia Pym, the child of Hank Pym and his first wife, Maria Trovaya. Being the biggest Avengers fangirl around, it’s actually Ms. Marvel who fills team in. Before Hank met Janet, he fell in love with Maria, a hungarian woman who first appears all the way back in Tales to Astonish #44, published in 1963. The two were married, but during their honeymoon Maria was kidnapped and murdered by communist agents... and was apparently pregnant during the kidnapping, as she gave birth to Nadia before her death. Raised in captivity (and apparently taken in by the Winter Soldier) at the infamous Red Room, the training ground the Black Widow, Nadia’s legacy was revealed to her by her captors, hoping to shape Nadia into a valuable asset. Instead she dedicated herself to deconstructing her father’s work, studying Pym particles until she could use a black market sample to shrink herself and escape to reunite with her father—until she learned he had died (although it’s a bit more complicated than that). Now Nadia wants to help the Avengers and carry on his legacy as a scientist and a hero... and, with Jarvis’ help, meet her family. Many had speculated that the new Wasp would be linked to Hank in some way, with most expecting her to be Hope Pym, Janet and Hank’s daughter from the MC2 universe, tying into the presence of Hope Van Dyne as the Wasp in Marvel’s movie universe. But it turns out the connection is a lot more complicated than anyone could have guessed. We’ll have to wait a bit longer to see just how Nadia fits into the future of Marvel’s All-New, All-Different universe... especially if her dad is on his way back to Earth.